Shared Dreams is very well-equipped for cruising and ready to go now. 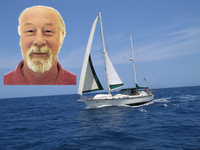 She has a below deck auto pilot as well and a Hydovane wind vane for steering, she has solar panels and a wind generator to keep the new batteries topped off, a hard bimini and full enclosure for protection from the elements, she is ketch-rigged for various sail options, has an enormous galley with a huge fridge and freezer, a fuel polishing system and plenty of room for family and friends. See attached pdf file for details and pictures. Last Edit: 2 years 3 months ago by ConejoGrande.